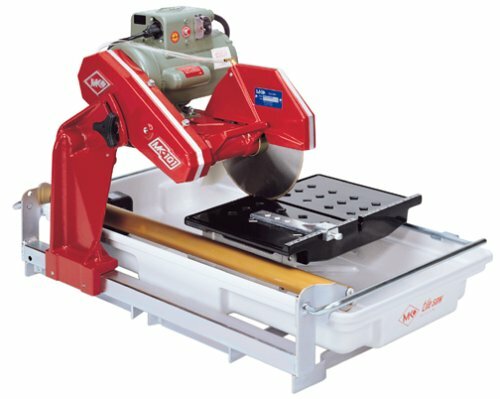 The MK-100 10" 1 1/2HP Tile Saw is an excellant saw for the money. I researched many different brands and sizes of Tile saws. 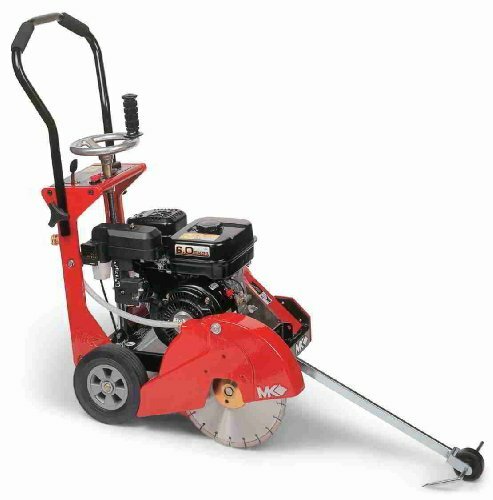 I wanted one that could cut a variety of different types of tile and the ability to diaginaly cut twelve inches. 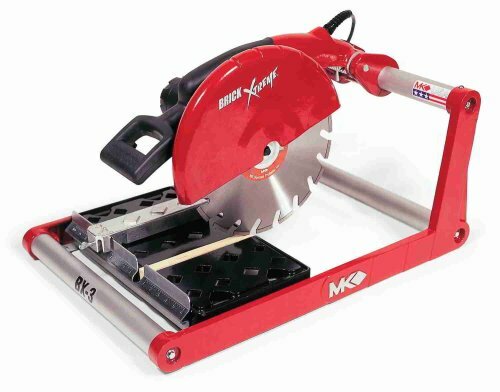 I talked with an MK service rep and he said the MK 100, their newest saw, was basically the same saw as the 101. It does have a different motor and there is no cover over the slide assembly. 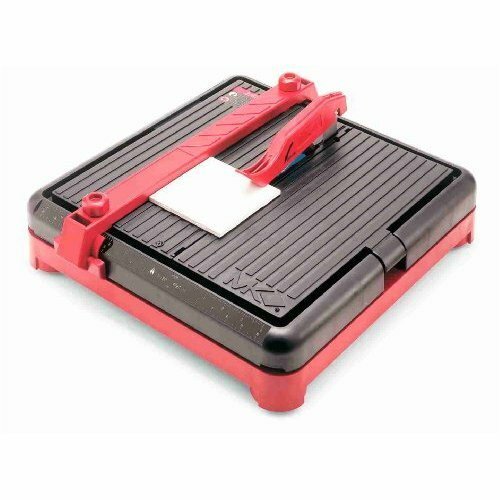 The MK-100 will cut 12" floor tile in about three seconds. The saw sounds the same as the 101, basically the same machine, just two or three hundred dollars less expensive. The saw comes with a very good instruction booklet and everything needed to cut tile. 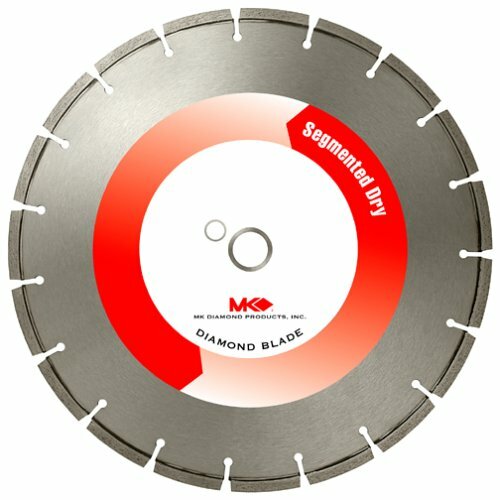 The Diamond blade could be better, but you can easily replace it when it becomes dull. This saw is pretty good for alot of different kinds of tile.Ihave owned one for over 2 yearsand have had no major problems.Igave it three stars because the table has alot of play in it so cutting stright cuts every time is hit or miss,its alot better if you use the stright edge that comes with the unit and push only with your left hand and use your right to hold your tile.I like the table ,because the tile can be put in the middle and not slide,very handy when you are cutting notches.The saw is very noisey so dont get scared when you turn it on.The water pump is the worst part of the saw.I had to start pluging it in ,get it pumping then hook it up to the saw and leave it running until I was through cutting all of my tile.It did help to clean the pump after I was done by putting it in a bucket of clean water and let it run for 15 minutes.The saw was easy to clean and move around.I rip 13 inch tiles all day long with no problem.I probably have over 200 tile jobs on it so far and still plan on many more.I have also just purchased a 660 for the better guides and the quite dc motor cant wait till it gets here. After reading many reviews I opted for the MK-370. What a great choice I made! I am an amateur in the greatest sense of the word and this saw made me look like a pro. If you are a do-it-yourselfer and probably will not be ripping anything bigger than a 13"
tile, this saw is great. Diagonals are a little hard but I was able to free hand them with no problem. The saw sprays a little water so you are better off using it outside. The only other thing I would recommend is that you purchase the protractor attachment that works with the saw for some of those angled cuts. I don't believe you can buy it on this site, but finding it on the internet was easy as MK saws are very popular. If I ever buy another saw you can bet it will be an MK. I just finished using this saw on a kitchen remodel with 16 inch limestone tiles. Rips fit on the table but for diagonal cuts I had to make a jig to raise the tiles clear of the back push fence and flip the tiles over after cutting them half way or so. Yes this is a loud saw so ear plugs should be worn. The sliding table did bind a bit because of all the weight from those 16 inch tiles hanging off the front but if you push with your left hand and hold the tile with your right it works fine. With reasonable care I was able to get accurate cuts. I recomend lubing the rails with silicon grease because it holds up better than the oil provided with the saw. One modification I made lessened the amount of water splatter off the rear mudflap. I replaced the stock mudflap splash guard thingy with a similar sized piece of that green fake grass looking doormat. The force of the water coming of the blade is difused by the stiff hairs of the door mat stuff and does not create as much mist around the back of the saw. 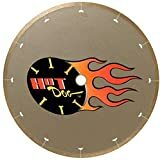 I got the idea from these special mudflaps used on tractor trailers and it works great. Next I'm working on an idea to keep water off the rails. 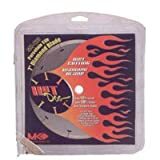 After lugging around saws that weigh over a hundred pounds and are no more accurate I really enjoyed using this lightweight alternative. I would recommend it to any one from the DIY'er to pro remodelers like me. I'm not exactly what you would consider "handy," but my wife and I decided to tile our master bath anyway. We tried renting a wet saw, but found that put too much pressure on us to get the job done quickly--not a possibility with my skill level. The MK-370 was a perfect choice for purchasing. It was easy to use and cut through our porcelain ceramic tile like butter. And owning this saw allowed us to work at our own comfortable pace. To our surprise, our project turned out better than expected and I can say that this saw was a major reason why. first of all. this saw cuts very accurately and the slide works very smooth. no need to get Japan involved in making this saw, like some other reviewer posted. and also, if you need an owner's manual on how to work this saw, then maybe you shouldn't be laying tile. I have used this model many times and have never had a problem with it. Full of power and precision. MK has done a great job. I need to tell you about my MK 101 Saw. Recently the saw stopped working and I contacted your sales office. They were very helpful and overnighted a new switch to me. Since my saw was dead there is a quick fix to get a person by until a new switch can be obtained. The switch is a 20A DPDT. The second set of contacts are not used and if the first set of contacts is the problem simply swapping to the other set will get it working. They will not be worn or burnt from the constant on off cycling. I bought the saw from a local distributor. They charged my $1085.00 for the MK 101. Since that time I have found that $799.00 is the average price. I will not do business with that distributor again. The saw cuts very well however it has more vibration in the bade shaft than when it was new. At this wear rate by next year it will have to have new bearings/sleeves. My biggest complaint is the quality of the sliding table and attachments. The set screw rip guide is difficult and time consuming to make small adjustments. The tiny finger bolt to tighten the guide loosens with saw vibration unless tightened with pliers. MY fingers wont do it on such a tiny surface without pain. Use of pliers is making the back of the sliding table rough because it is soft material. Eventually this surface will be ruined and fine adjustments impossible. Why not put a sliding cam-lock fence like you find on quality table saws. Time putzing around with the existing one is costing me money. It is also common for me to lay tile on a diagonal or cut tile to fit on a tapered wall. The fence should have a quality protractor and pivot. Or, it should be a quality piece that can be added to the fence or used separately. The scale on the sliding table is worthless. Why put one on there if your not going to spend the time to make it useful? The dimple surface on the table helps but I still wash it down with a sponge often. On either side of the cut line should be a solid rib and the kerf should be no more than twice the thickness of the blade. Better yet these two flats should be independently adjustable. They could then be closed for cutting mosaics and glass tile. The saw is too heavy. I could cut 30% off by using better materials and doing some engineering. I have mine strapped to a dolly. You could just mount your saw to a designed for the purpose dolly. Put a seat on the handle end. That's what I did with mine. The tub did not fit the frame when I got it. I had to grind and smooth the frame opening so I could get the tub in and out without damaging it. The vacuum formed tub scared me when I first saw it. It has held up ( I am very Careful) but a rotationally molded PE or PEX tub would be better. The little added fence holder welded on is worthless. The fence does not fit and sticking out like that is a hazard. Put a latch on the far end (under the motor) of the sliding table so when you push it forward you can make it stay when moving the saw. I have gotten some pretty painful knuckle/finger slams when the table slides out of control when I am trying to lift this beast into my truck. So there you have it. As a result I am in the market for a better saw. From what I have seen though your saws are not designed to make the tilers life easier so I am shopping around. I researched tile saws for a long time before I bought this one. I had a small Plasplugs unit that served me (and several of my buddies) quite well for many small jobs. The last job I did was Saltillo Tile which I had to cut with a hand grinder and a dry blade - effective but what a mess. The MK-101 is built like a tank and easy to use. No, it's not for beginners but, unlike some of the previous reviewers, I found the manual detailed and thorough. It cuts smoothly, largely in part to it's 10" blade but also the excellent track and cutting table. 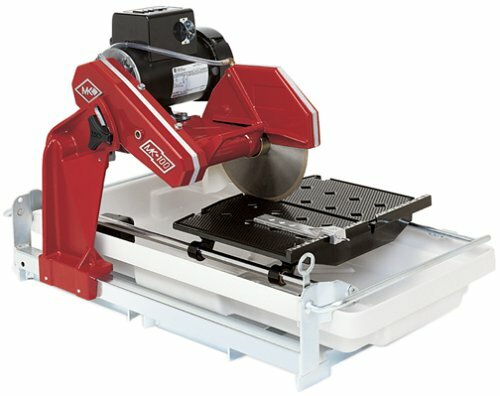 It may never be as accurate as a table saw but, it is the best tile saw out there that I have seen. When cutting 12"x 12" floor tiles there's no chipping of the finish glazing - it cuts almost too smooth and there are sharp edges left - be careful. All in all a major investment but worth it in my opinion. Go to a pawn shop and you'll find them 10 years old, beat up, for [cheap]. With the free stand and cutting kit I chose it over he MK-100 for the extra power - my Dad always told me: "get the biggest and most powerful motor on any tool and you'll never be sorry". He's been right so far. I wish the Japanese could help these guys with engineering their saw. It has the potential to be a great tool but lacks some engineering. It reminds me too much of American made tools. Oh, that's right, it is American made. The table is very sticky. Never seems to get much better even with lubrication. It is hard to line up your work. I found I can line up the beginning of the cut but there is no real way to line up the complete cut without raising the head and doing trial runs. The instructions that came with it are poorly written and incomplete. 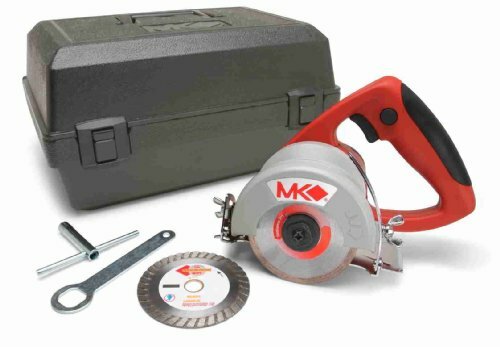 I went to MK's website and found a better version, but they seem to assume the purchaser already knows about their saw. The instructions on saw head placement are useless. I still don't know where to put the saw head for a given application. The water bin stopper should have a string attached to it and the saw to keep from losing it. It is just a matter of time before I lose that thing. The ATS stand, with wheels, is a necessary option because of the saws weight at 110 pounds. Otherwise you must have two people or disasemble the saw each time you move it. The instructions to assemble the ATS wheeled stand are the worst I have seen in twenty years.It is obvious MK needs new minds in their saw engineering and in their instructional editing. The motor is powerful at 2hp. The blade that comes with the MK-101Pro makes ceramic tile and marble feel like butter. The saw frame and body are heavy duty and should last longer than your back. When I ordered the saw from a vendor I also ordered an additional blade. Both were to be drop-shipped from MK. The truck line failed to give me the saw blade when they delivered the saw. I notified MK and they promptly shipped me another. The first blade showed up several days later from the trucking company, the same day as the second blade they shipped on UPS. I promptly returned one of the blades. It was nice to be trusted. This is a great saw for the serious do-it-yourselfer. I like its portability and fast cutting time. I dislike the amount of dust it puts out compared to a wet saw. At 65 pounds you can throw it in the trunk and take it anywhere. We have been using it on cast concrete retaining wall block. The original idea was to use it on the decorative caps, which had a 3" by 12" cross-section. However, it will get about 90% of the way through a block with a 6" by 12" cross-section if you want to split the big block. Cutting time through the 6" by 12" block was around a minute, answering my concern about the motor, which looked small. The surface finish is very smooth, to get rough faced cuts you will still need to split using a hammer and chisel or block splitter. Don't try to rig your own water system to the saw, the motor has an external filter and does not appear to be sealed. Dust may be a long term issue. You certainly want face protection, a dust mask, and hearing protection. A great deal for the price!! 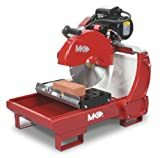 The MK tile saw is in my opinion a great deal, for $79.00 it's not going to be made out of heavy gauge steel or aluminum, the all plastic body is just fine though, better than steel cause it will never rust and just as light as aluminum. I have made probably 300 cuts so far with this saw and it has worked like a champ so far, it is a little bit on the loud side and will spray water at you if you over fill the water reservoir, it has had plenty of power and the fence works just fine if you line it up properly, it is light, portable and will suit the average DIY'r just fine, it will do anything that the bigger saws do just maybe a little slower, you can rent a professional saw which usually goes for around $50-$70 day but just buy this instead and take your time!! 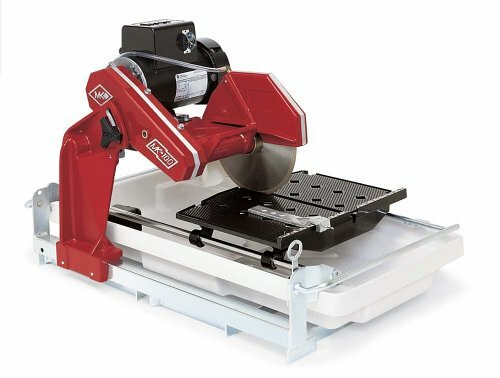 The bottom line...if you intend to do some small tiling projects around the home such as a bathroom, kitchen or entryway then definitely get this saw, if your going to be laying 5000 sq ft of tile with lots of cuts then durability might be an issue!! buy the proper tool for the job at hand. I started using the saw making repetitive cuts and I thought the saw was great. It did a fine job. The little saw cut quick and clean with no problems. I proceeded to cut pieces for trim work and the fun begin. Every tile was a different size and I had about 400 to do. It took me forever to do 40 because I spent a lot of time adjusting the rip fence. It is a pain after the table surface gets dirty. Bottom line: my job was too large for this saw. I went out the next day and bought a more expensive saw with a sliding table and a bigger reservoir. I finished the rest of the tile in about 5 hrs. If you need a saw for repetitive cuts or for a handful of tile different sizes and you're on a budget then this is your saw. This could be a good saw if only the company had made the fence a little more durable and user friendly. If not just perfectly aligned the saw binds and chips the end of each cut. The guide could be easier to see also, as it gets filled with crud very quickly. I used it for about an hour on a small job that required many cuts and got so frustrated I put it back in the box for return tomorrow. That is why I deal with amazon.com. this effectively extended the bed about 12 inched in all four directions. I used a four foot straight edge and a couple of clamps instead of the supplied fence. As for the noise - wear hearing protection. I tiled a foyer, bath, laundry and closet (250 sq. ft. total with plenty of cuts around doors, pipes, mouldings) with 14 inch ceramic tile and this saw never missed a beat. I had considered renting, but this was my first tile job, and all the measuring and cutting took much longer than I had expected. Renting would have been much more expensive, and I wouldn't have the saw at my disposal to re-tile the master bath. I have been looking for a tile saw for a while, and after reading all the reviews and recommendations, I opted to buy this product. The package came complete and ready to use. After a few minutes assembling the hardware and testing it, I was extremely amazed of the performance. The motor is extemely quiet. The construction is very solid that, I think, will probably last forever. This is the one that you need not only for your home improvement project, but also for other use. In fact, I was able to finish my bathroom in no time with a professional looking new ceramic tile on it with the help of this beautiful machine. This wet saw is outstanding. What I enjoy most is the robust aluminum rolling tray and track system, which is very well designed and very well built. In particular, the yellow tubular guard along the left track essentially serves as an umbrella to protect the track & roller from the harsh grit (that splatters a lot from these wet saws) and becoming embedding into the roller bearing that would bind the tray badly. Second, the tray is heavy cast aluminum with nice finishing details. I thought it might be a heavy plastic composite from the pic. Not so! Also, the tray with a heavy rear square curb serves well for the T-square, bullnose (included), and other miter/bevel gear to clamp upon. 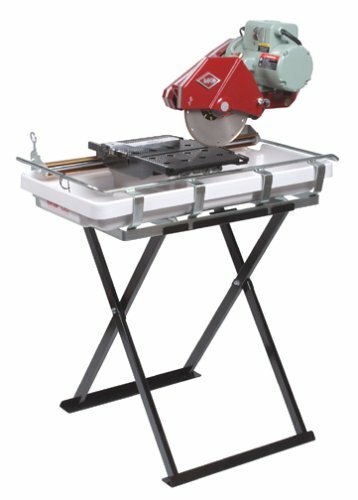 The whole saw with its superbly built cast aluminum construction (arm and all the red pieces), welded steel base, sealed motor/electrical fittings, and the fine details exceeds my expectations. I am very pleased with my purchase. I have confidence this saw will perform excellently, especially with the smooth, accurate tray & track system, for years and years. Post-350 ft2 & 36ft2 job: This saw performed better than I expected. I knew it had a great design and was well built, but after finishing my kitchen, eating area, hallway, foyer and adjoining bathroom and cutting 110 cut tiles, I can truly say how glad I was to have a good saw like the 660. Worth every penny. It was really nice to have the overhead blade to see exactly where you were cutting (i.e., my crayon marks) for precision. Well let me start by saying that my old saw was a MK370. The difference between the two was night and day,on the rails the 660 was 100 times more accurate than the 370 .Its alot more smoother and alot quiter.What I found was the 660 was alot more messy ,I mean that I could not set this saw up in the house I was working in like in the past.Sure I alwayse had to put a tarp down and rig a back spalsh but it was ok.The 660s table is not as deep as the 370 so you have to hold the tile more firmly.I miss the extra clearence under the saw the 370 had,for freehanding cuts.the pump is alot bigger and better.the saw seems to have as much power as the 370 but its alot smoother. I am glad I got this saw as a up grade to the 370 and would buy again.Cant see my self buying one of those 100 lb saws to do all the tile I do,just seems like a whole lot of work for the normal 10 or 12 cuts you have to saw ,and cant brake.Mabey if I was doing 18" marble I could afford a helper to carry my saw for me(:All around a great saw ,just remember this saw was a 7" not a 10".I think for a 7" its top notch.Dont be afraid to buy this saw. After about two weeks of using this blade I have to change my review. It still cuts a lot faster and the chipout is a lot less than the blade that came with the tile saw but...it's a thin kerf saw blade and there is a lot of flex in the blade. It doesn't like to cut bevels or cut a little off an already cut piece. I end up changing back to my old blade when I make a bevel cut or shave 1/16th off due to the flex in the blade. I just replaced the saw blade that came with my tile saw with this blade and what a difference. It cuts a LOT faster and chipout virtually disappeared. I'm glad I bought this blade and would do it again.